Caledon State Park surprised me with its quiet beauty, deep history, and abundant wildlife. Lying along the broad tidal stretch of the Potomac River about 50 miles downstream from Washington, DC, these 2,500 acres of riverside forest are a gathering place for bald eagles from up and down the East Coast. But the eagles weren’t the only thing that brought me to this Virginia park on a recent Sunday. I headed there with my wife, our one-year-old, and my parents for a day of exploring with the family. It was one of those rare August afternoons with low humidity and a pleasant breeze, perfect for a picnic in the shade of the spreading magnolias and gnarled old cedar in front of the visitor center. Caledon was a plantation for centuries after its founding in 1659. Remnants of that era can still be seen in the visitor center, a classic farmhouse built around 1900. There we were treated to a wonderful in-depth tour of the area’s history and nature by park volunteer, Carol Sparbel. She explained that the plantation once also served as a busy port that shipped tobacco. But as farming faded, the old fields slowly transformed into an oak and poplar forest. In 1974, Caledon’s owners donated the land to Virginia for conservation. At that time the bald eagle population had hit rock-bottom across the country. However, a notable stronghold remained around Caledon. Recognizing the importance of the site for eagles, in 1984 Caledon became an official state natural area. The governors of both Virginia and Maryland came together to declare the shoreline and nearshore waters an eagle protection area. For years the park was maintained in an undeveloped state to preserve the eagle population. Trails were closed during nesting season and camping was prohibited. But, with the support of research, a balance is now being reached that both welcomes visitors and respects the eagles. In 2012, the natural area became Caledon State Park, allowing more possibilities for recreation. Trails are now open year round, and six primitive campsites – accessible only by a hike or paddle – lie near riverside wetlands. Still, this remains a place of peaceful pleasures. There are no cabins or drive-in campsites full of trailers and RVs. The Potomac River can’t be reached by car, requiring instead a nearly two-mile walk or bike ride each way. My family and I didn’t run into anyone else on our stroll to the river on Boyd’s Hole Trail – more of a well-maintained gravel road on gently rolling terrain. It’s closed to motor vehicles but perfect for a nice walk. The leafy hardwood canopy cast plenty of shade over the path. Nearing the river, we passed the verdant wetlands of Mallows Marsh, where frogs croak and great blue herons hunt. Soon the Potomac came into view, placid and nearly two miles wide. A long narrow beach lined with driftwood marked the shoreline, and a few picnic tables offered a waterfront view. We headed straight for the small observation platform at the river’s edge. Within a minute I spotted an eagle flying out over the Potomac, scanning for fish. It swooped down to the water, grabbed its prey, and flew back to the forests on the riverbank. Just then a second eagle alighted from the trees and headed over the river. The show continued as long as I kept my eyes trained on the water. July and August is peak eagle watching time at Caledon. In the late summer “there is typically a pulse of hatching-year birds out to the shoreline as they fledge from local nests,” Bryan Watts, director of the Center for Conservation Biology, wrote in an e-mail. These youngsters mix with adults that live there year-round, as well as migratory birds that come up from Florida to spend summers around the Chesapeake Bay. “The other peak time would be December through February, when the birds from the Canadian Maritimes and New England migrate down to the Bay and congregate in areas like Caledon,” Watts said. For those interested in checking out the eagles and more, the park has a huge variety of activities and programs for all ages. That includes ranger-led kayak excursions on the Potomac, eagle tours, fossil hunts, stargazing, and visits to remarkable ancient trees. On my next trip, I’d like to take my family to Caledon overnight to experience what Ranger Peal calls “total seclusion” at one of the hike-in campsites between the river and Jones Pond. We’re already looking forward to another tranquil trip on the water. 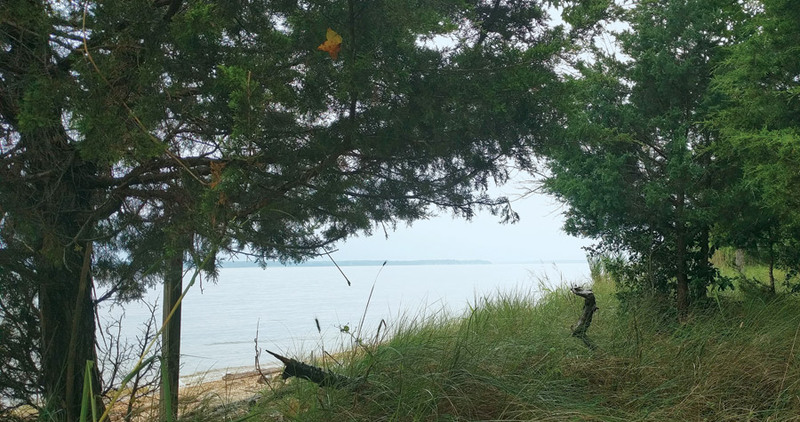 Note: Caledon State Park is the latest access point to the Captain John Smith Chesapeake National Historic Trail. The park has six new campsites dedicated to paddlers on the trail. Read more about this exciting development. Kenny Fletcher grew up on the shores of the Chesapeake Bay in Southern Maryland and now lives in Richmond, Virginia. 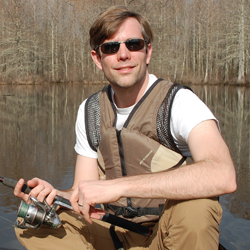 He loves fishing and paddling on creeks and rivers, enjoys a nice walk in the woods, and is always on the lookout for a great story.